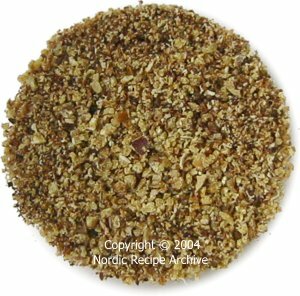 Listed below are some spices frequently used in Scandinavian, Finnish and Russian cooking and in the recipes of this site. Saffron is the hand-picked and dried stigmata of a variety of crocus flower. It has an intensive flavour, so it is used in very small quantities. Also because it is a very expensive spice, it is usually bought in a few gram portions only. Saffron gives foods a deep reddish-yellow colour and a pleasant, warm and spicy flavour. It may be used in cooking either whole or ground, or it can be soaked in warm liquid or alcohol which is then strained and added to food. 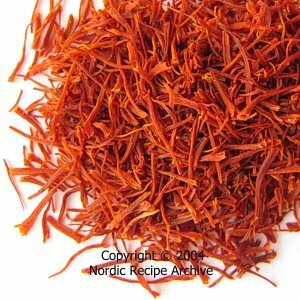 Saffron is used to season many Arabic and Indian rice, meat and vegetable dishes and various sweet baked goods, like the Swedish saffron buns lussekatter, or the traditional Russian Easter cake kulich. Besides vanilla bean, vanilla comes in many forms and is used to flavour numerous foods and desserts. Read more about vanilla bean and its substitutes here. 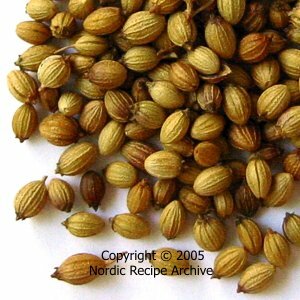 Cardamom seeds are a very popular spice in Scandinavian cooking. They are frequently used to season various sweet baked goods, breads, cookies, chocolate desserts, fruit salads, coffee drinks and liqueurs. It is best to buy whole cardamom pods for the seeds to retain their flavour longer. In picture above from left to right: green cardamom pods, cardamom seeds, crushed cardamom seeds. See a recipe for Finnish sweet yeast buns. 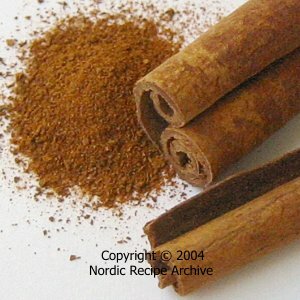 Cinnamon is much used in Nordic cuisine to flavour various sweet baked goods, cookies, fruit salads and compotes, preserves, mulled wines and other beverages. It is sprinkled on dessert porridges, puddings and local cultured milk products. 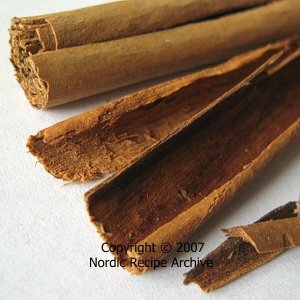 Cinnamon, the fragrant dried bark of the cinnamon tree, is sold powdered or in the form of thick rolled sticks. In most western stores, the products sold labelled as "cinnamon" are actually the bark of cassia tree (Cinnamomum cassia, C. aromaticum), a close relative to the true cinnamon (Cinnamomum zeylanicum), known as Ceylon cinnamon. Cassia has a more pungent and spicier flavour than the subtly fruity and mellow true cinnamon. True cinnamon bark is lighter in colour, much thinner and fragile and it can be powdered easily. European health agencies have recently advised against consuming large doses of cassia bark, as it contains relatively high amounts of coumarin, a substance toxic to the liver and kidneys, whereas true Ceylon cinnamon does not pose a health risk, its coumarin content being very low. In Finland, common food items measured to contain the highest amounts of coumarin include cinnamon rolls, gingerbread cookies and rice porridge sprinkled with cassia, or porridge/cereal and muesli mixes flavoured with it. In addition to these, exposure to coumarin may also occur through certain cosmetic products, like perfumes. The Finnish Food Safety Authority has advised that small children especially should not be fed cassia-flavoured foods on a daily basis, as merely one cinnamon roll or a plate of porridge sprinkled with cassia may contain coumarin enough to exceed their tolerable daily intake of it. Pungent, peppery flavoured cloves are the dried flower buds of the clove tree. They are sold whole or powdered. Clove is used to flavour sweet baked goods like cakes and cookies, fruit compotes, various meat, game and sea food dishes, vegetable and mushroom pickles, mulled wines and other beverages. Allspice  also called Jamaican pepper  is the dried berry of the allspice tree. The berries are sold whole or ground into powder. 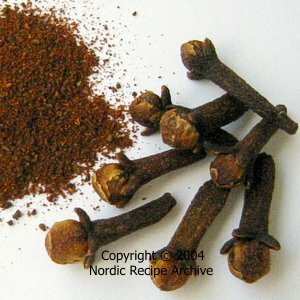 Allspice is very popular in Finland, where it is sometimes used to replace black pepper. 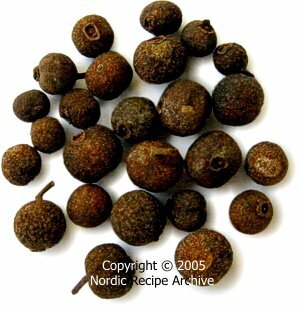 Allspice can be used to season many savoury or sweet foods like cookies, fruit cakes, vegetable dishes, pickles and preserves, lutefish, herring and various meat dishes and preparations, like sausages or Swedish meatballs. 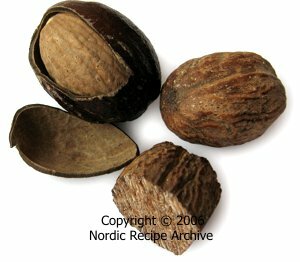 The hard seed of the nutmeg tree, nutmeg can be found sold whole or ground into powder. It is best to buy it whole and grate it as needed, so that no flavour is lost. Because it contains a narcotic substance called myristin, nutmeg should only be used in small quantities. Nutmeg can be replaced with mace, which is the bright red membrane  known as "aril"  covering the nutmeg seed. It is usually sold ground. The thick peel of Seville orange, also called bitter orange, is used dried as seasoning. It is sold in pieces or in powder. 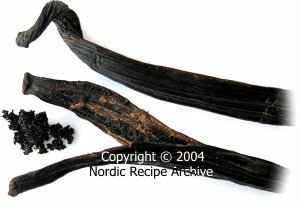 In Finland, Seville orange peel is most often used to flavour various desserts, gingerbread cookies, fruit cakes, breads and the local Easter speciality mämmi. It is also used to season game dishes, sauces, mulled wines, liqueurs and other beverages. 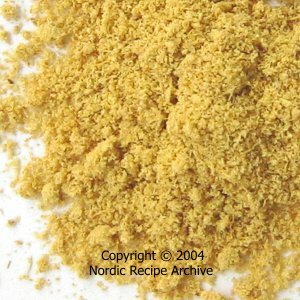 In Finland, dried, powdered ginger root is mainly used to flavour baked goods and desserts like breads, rusks, cakes and cookies. It is also sprinkled on fruit salads, porridges and various local cultured milk products. Since the taste of ginger powder is very mild, it is used when only a subtle taste of ginger is required. For a stronger flavour, replace ginger powder with a smaller amount of fresh, finely grated ginger. Fresh ginger should not be replaced with powdered ginger. See a recipe for Finnish Christmas gingerbread cookies. 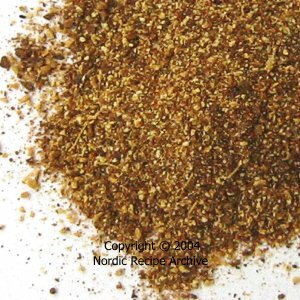 Finnish gingerbread spice is a mixture of ground spices similar to apple pie spice. It may contain powdered cinnamon, nutmeg, mace, allspice, ginger, Seville orange peel and/or cardamom. 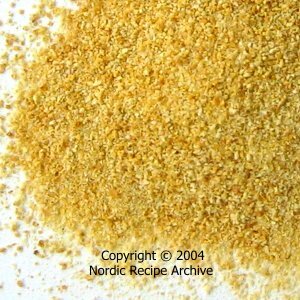 Gingerbread spice is mainly used to flavour Finnish Christmas gingerbread cookies but it can also be used in fruit and berry pies, cakes and other desserts. See a recipe for gingerbread spice. "Four spices"  also called quatre-épices  is a ground spice mixture usually containing (white) pepper, nutmeg, ginger, allspice, cinnamon or cloves. It is used to season meat and game dishes, stews, terrines and pâtés. In Scandinavia, four spices is used to season the Swedish Wallenberg steaks, among other things. See a recipe for four-spice powder. Besides the Arab countries and India, the strongly scented and highly aromatic caraway seeds are also widely used in Germany and Russia and in Nordic countries like Denmark and Finland. The dried seeds are used whole or ground to season many meat and vegetable dishes (especially lamb, cabbage and sauerkraut), cheeses (eg Münster), bakery products like breads and crackers, liqueurs and Scandinavian akvavits. 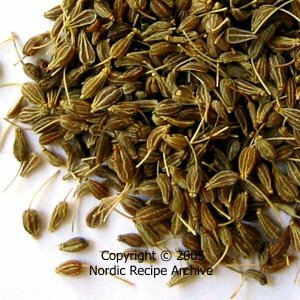 Caraway seed should not be confused  or replaced  with cumin seed (Cuminum cyminum)  the two have a completely different flavour. Unlike the fresh coriander leaves, the ripe, dried coriander seeds have a pleasant scent and a lemony flavour. 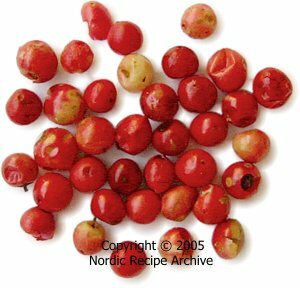 Coriander seeds may be used whole or ground to flavour a multitude of dishes, spice mixes, marinades, cakes, cookies and beverages, like certain Scandinavian spirits. They are also an indispensable flavouring ingredient in the German bratwurst sausages. 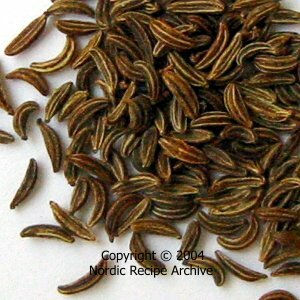 Dried anise seeds, also called aniseed, have an aromatic flavour slightly reminiscent of liquorice. The seeds may be used whole, crushed or powdered. Anise seeds are used to flavour breads, rusks, cookies, candies and beverages, like raki, ouzo, pastis or sambuca. In some dishes, a little anise seeds may be used to replace fennel seeds (see right). 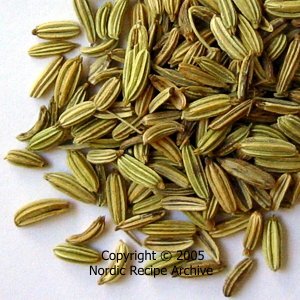 Dried seeds of sweet fennel are used in cooking. They taste slightly of liquorice or anise (see left). Fennel seeds are used to flavour both savoury and sweet dishes, like breads, rusks, cookies, cheeses, sauces, pickles and beverages. The bulbous base and feathery leaves of another type of fennel, the Florence fennel, or finocchio, are also used in cooking. In picture above: Fresh, ripe juniper berries (left) and dried juniper berries (right). Juniper berry is the edible fruit of the juniper tree. The deep blue berries are mainly used to season meat and game dishes, vegetable dishes, sauces and various herbal and alcoholic beverages like gins and genevers and some Scandinavian spirits. Juniper berries are usually sold dried. They can be used whole or crushed and are usually removed from the food after cooking or before serving. 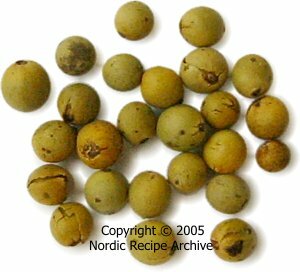 Green peppercorns are derived from the berries of the same woody vine plant as black peppercorns and white peppercorns. While black pepper is derived from half-ripe berries and white pepper from wholly ripened berries, green pepper is derived from unripe berries. The berries are sold dried or preserved in brine or vinegar. With its slightly fruity flavour, green pepper can be used to season sweet dishes like fruit desserts as well as savoury dishes and sauces. Pink pepper berry, also called red pepper, is derived from two plants, the Brazilian pepper tree (Schinus terebinthifolius) and the California pepper tree (S. molle). The berries are sold dried. With its slightly resinous taste, pink pepper may be used crushed and sprinkled on meat and game dishes, in sauces, desserts or mixed in pepper blends  like mélange des îles. Pink pepper may cause allergies in sensitive individuals.